Autumnal sun in the East coast visiting wonderful Washington, New York and Boston. Discover a trio of great cities arrayed against the striking background of Fall’s russet reds and golden hues. Beginning in historic Williamsburg, we’ll journey from Washington to elegant Boston via the wonders of the Big Apple. Take in Virginia’s Blue Ridge Mountains, stroll Charlottesville’s historic streets and see the hideaways of the ultra-rich in Rhode Island on this wonderful autumn tour. Fly to Washington, and transfer to your hotel in colonial Williamsburg. Rest and relax after your journey, and enjoy the first of two evenings in this city with its connections to the War of Independence. Step back in time on today’s wonderful optional excursion. Our first stop is historic Jamestowne, the first permanent English settlement in America. Explore the Glasshouse, and see artefacts from the original Jamestown Fort, before we continue to colonial Williamsburg to discover what life was like in the pioneering days of the 18th Century. Stroll through the formal gardens, hear ‘residents’ in period costume discussing the day’s events and perhaps visit a tavern to sample some traditional 18th-century fare. Today you’ll visit exquisite Charlottesville – home of Thomas Jefferson, Founding Father and the third US President – where early America is lovingly preserved in ancient magnolia-lined streets. You’ll also take an included tour of the fabled Blue Ridge Mountains, whose natural wonders can be explored in beautiful Shenandoah National Park. This evening is spent in Tysons Corner, close to Washington DC. 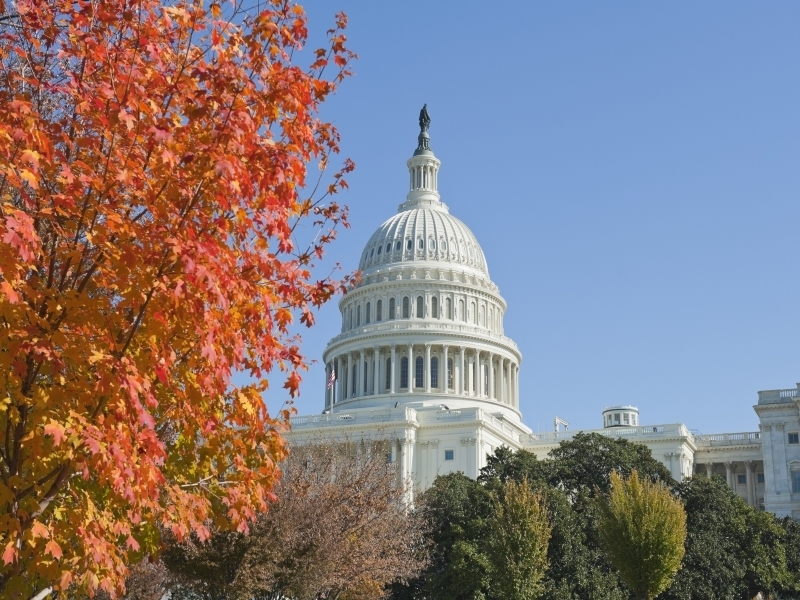 Visit the enthralling US Capital, Washington DC. Our optional guided city tour will introduce you to the world’s most powerful square mile, which includes Capitol Hill, the Washington Monument, the Lincoln Memorial and – of course – the White House. After our visit we’ll continue north to New Jersey for a two-night stay. An unforgettable day, as you cross the Hudson River to Manhattan, the heart of the incomparable Big Apple. Shop, take in the world-famous sights, or join our optional city tour, during which Central Park, Fifth Avenue and the Empire State Building will be thrillingly revealed. Today you’ll head north through upstate New York towards Boston. En route, you’ll stop in Newport, Rhode Island, home to the famous ‘summer cottages’ of America’s rich and famous, which dot the rocky shoreline. Take in the atmosphere before we continue, through the colourful Fall scenery, to our hotel in Hull, south of Boston. Spend today relaxing, or join our full-day optional tour to Cape Cod and to Hyannisport, home of the Kennedy clan. Here you’ll see the JFK Memorial before heading to Plymouth in time for lunch (not included) before finishing the day at the Plimoth Plantation, a living museum where the settlers’ lives are re-enacted by staff in period costume. Travel into Boston, America’s most ‘European’ city. Join our optional city tour and discover Boston’s rich history as you take in sights including the gold-domed State House overlooking Boston Common and the cobbled streets of wealthy Beacon Hill. This afternoon you’re free to explore. Visit Faneuil Hall and nearby colourful Quincy Market. Stroll around the harbour, pay a visit to the famous Tea Party ship, explore the delightful streets of Midtown or cross the Charles River to Cambridge – home to Harvard University – then head to the airport to board the flight back to the UK.